In theory, it should be straightforward to establish copyright on your work. All you need do is demonstrate when (and where) you created the music/poetry/prose/painting/image/design/font/etc., and that the work is original and not itself a copy. This is far fairer to creatives than patents, which are subject to complex and costly approval processes which often seem to support the protection of the absurd, provided that it is presented cunningly by a patent lawyer. Although there are businesses which offer to ‘register’ your copyright, and in most cases creators are advised to use the explicit symbol © together with a year and their identification, these are actually unnecessary under most national legislation. Two current cases, though, show how messy copyright can become. The first is the high profile and sorry saga over the rights to the globally popular Happy Birthday song, in which true creatives have had no interest for many decades. However Warner/Chappell Music seems still to collect a couple of million dollars a year from its commercial use, and intend trying to continue to profit for some years to come. Now the makers of a documentary movie about the song, and others, are challenging this in the US courts. Wikipedia has further interesting information about the circumstances. It looks as if that case will revolve around the question of when the song was created, by whom, and whether the creator allowed free use of it during their lifetime, effectively giving up any copyright. As is usual, all the creatives involved are long dead, and no longer able to benefit from current licensing fees. The other is the bizarre news that J. K. Rowling does not ‘own’ Harry Potter. Apparently the character, actually Harry Potter, Jr., first appeared in the movie Troll (1986), before Rowling first came up with the idea for the books (1990), before she completed the first manuscript (1995), and before publication of her first novel in the series in 1997. Although swords have not yet been drawn over intellectual property rights here, there was a rattling of sabres back in 2008, and with a new movie in production, apparently looking to capitalise on the name of Harry Potter, Jr., it looks only a matter of time. Thankfully these should all be issues of the pre-digital past. All you have to do now is to create an electronic document recording your creation. This could be a photo of a painting or sculpture, a musical score, design files, or the original text. Then just drop that document onto Bela Gipp’s OriginStamp website, as detailed here. 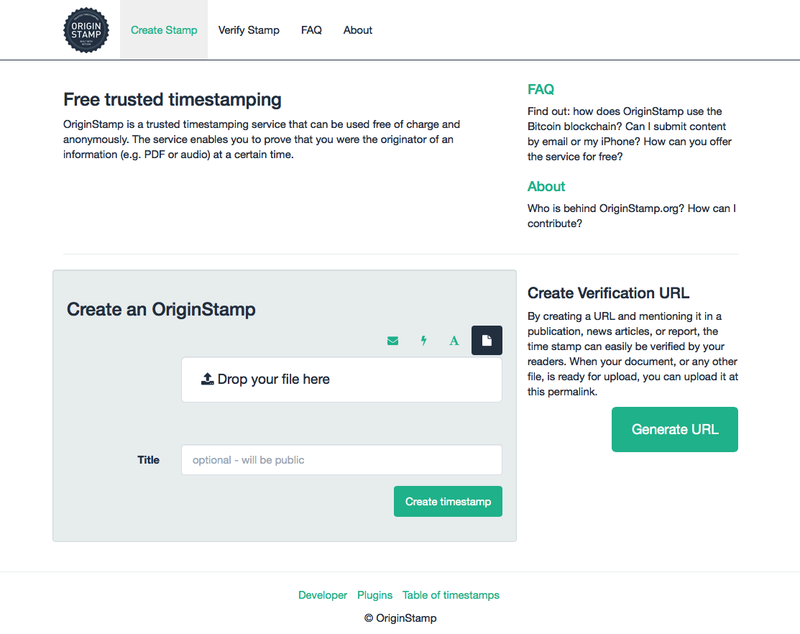 Creating an OriginStamp for a document is free, and could not be simpler. Archive the original document (not altered in any other way, as that would invalidate its digital signature), its hash signature, and the date of timestamping, and you have proof of your creation. What could be simpler, cheaper or more robust? Posted in General, Language, Life, Macs, Painting, Technology and tagged copyright, Happy Birthday, Harry Potter, IPR, OriginStamp, timestamp. Bookmark the permalink.